Today could be interesting. That storm that never materialised yesterday seems to be getting revenge by becoming heavy rain in today's forecast. Goodby lovely camping pod. It's not raining...yet. I have for a couple of weeks now been in communication with BAT reader Glyn and we're to meet up with him at a cafe in Llandovery at 1530. Our trip has also caught the attention of Lee via Facebook and we're going to his place for a brew en-route at about 1300 somewhere in the Brecon Beacons. We'd best get going. So far - so good. The rain isn't and I'm not lost. Fear not, there's plenty of time yet. Random horses at the roadside. 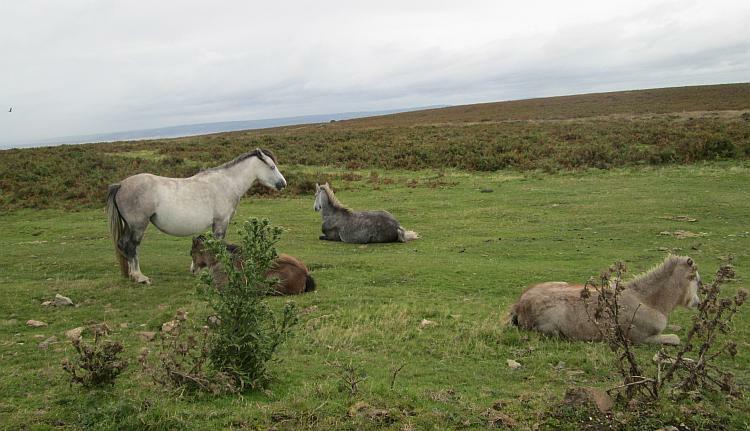 Not an uncommon site on the Gower Peninsula. With just a little time on our side I find my way to M&P on the outskirts of Swansea. M&P sell motorcycle stuff like jackets and helmets. So do Busters who are also at the same address. So is Swansea Harley Davidson. So is Swansea Kawasaki it seems. We find the Harley shop and park up. Sharon wanted the Kawasaki shop, fear not that's behind the Harley shop along with a cafe. We look around and I take a moment to sit on the new Versys 300. Save for a few cabinets with bike gear in them though we don't see much to suggest this is a massive online retailer of motorcycle gear. There is a random barber shop in the centre of it all though. Odd, most odd. Here comes the rain. A short hop on the motorway then we're on the A4067 and it's belting down. By the time we arrive at Lee's place in Cwmllynfell (how the heck do you say that?!) we're dripping. Lee is bright eyed with a healthy glow to his olive skin and welcomes us with a big handshake before ushering us in out of the rain. His wife is working so we retreat to his den, a good sized shed up the hill in the garden complete with settee and chairs, tea, milk and a handful of motorcycles. I sit and look around enviously. As the rain rattles the windows we get to know one another. He's done some serious travelling on two wheels as well as in other ways. He knows all the players both big and small in the adventure motorcycling world and seems to split his life between work, welcoming random wet motorcyclists into his den and spending a great deal of time in The Alps. I'm even more envious. After supping tea and sheltering from the weather Lee is going to lead us over the Black Mountain Pass to Llandovery where we'll meet Glyn. 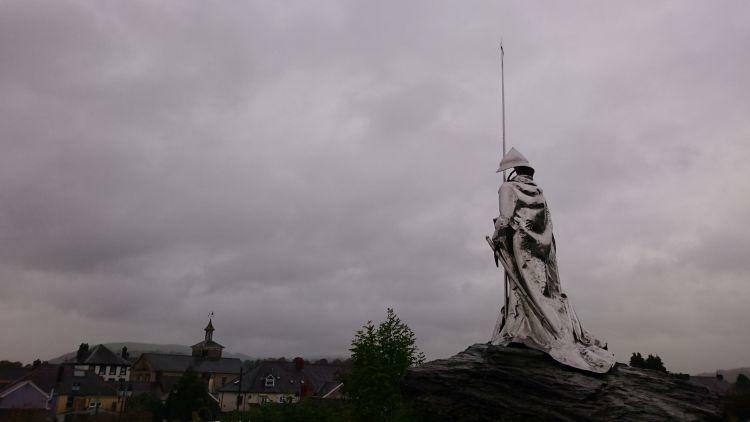 He's a bloody fool I tell you, it's belting down outside, we're already on the right road and even I the king of getting lost believe I can find Llandovery. I think he likes the ride even in this weather. We don't actually get to see and enjoy this famous road. We do ride it we just can't see it that's all. The rain becomes wet mist as we climb into the clouds so visibility is about 20 metres in places. I figure Lee knows each and every bend as he's away, waiting at times for Sharon and I to essentially feel our way around the sweeping curves, switchbacks and corners. I'm struggling with this but I've done it often times before, I imagine Sharon is freaking out behind me but she's more than skilled enough to keep it on the black stuff. Between Llangadog and Llandovery the road is lower and a little less twisty. I've still no chance of keeping up with Lee, he knows how to ride and seems fearless although Sharon and I are making good progress. Still it comes as a relief when we slow down to enter Llandovery, that was a hell of a ride. West End Cafe is a popular biker's cafe, even on this horrible day there's 4 or 5 bikes parked outside as well as our own. Lee purchases a round of welcome hot tea as we sit, our kit dripping all around. Glyn appears as a tall slender chap definitely from the old school of motorcycling. Long hair, well worn kit with a gentlemanly and calm manner that belies the whole scary biker thing. Considering how wet both our new friends are they are both in good spirits, I am happy to sit and talk and drip for a while. Lee departs, he has things to be getting on with so we bid our farewells and thank him for looking after us. 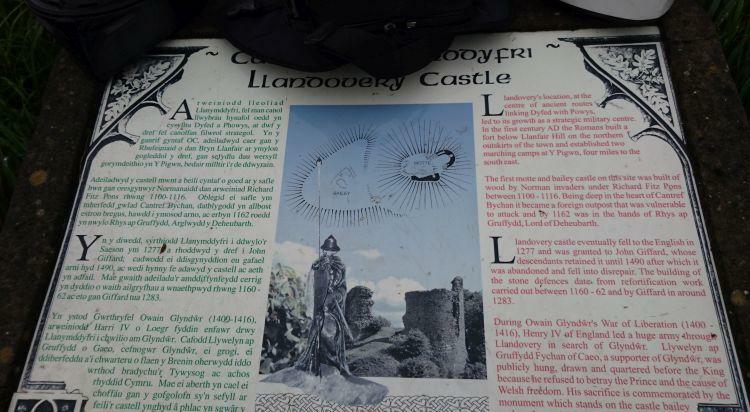 Glyn stays and brings the area to life with a little history and a few tales of his own life. There really is no substitute for local knowledge. Glyn takes us just around the corner to show us a statue. 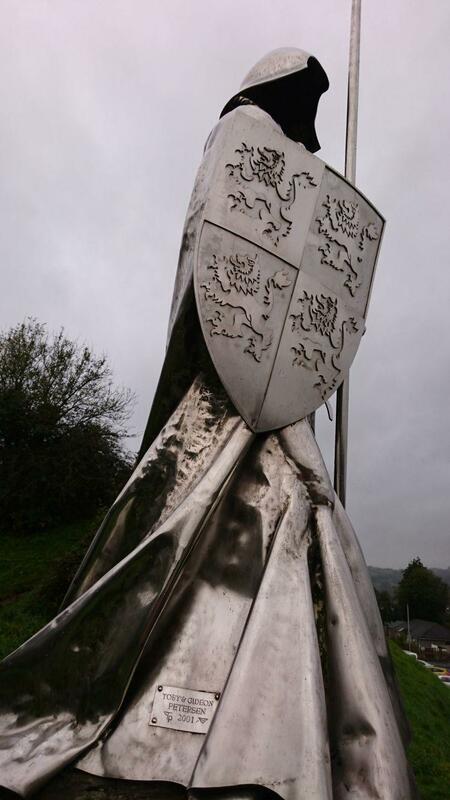 While not a likeness this statue is to commemorate Llyweln Ap Gruffydd Fychan (Not to be confused with another Llyweln Ap Gruffydd). 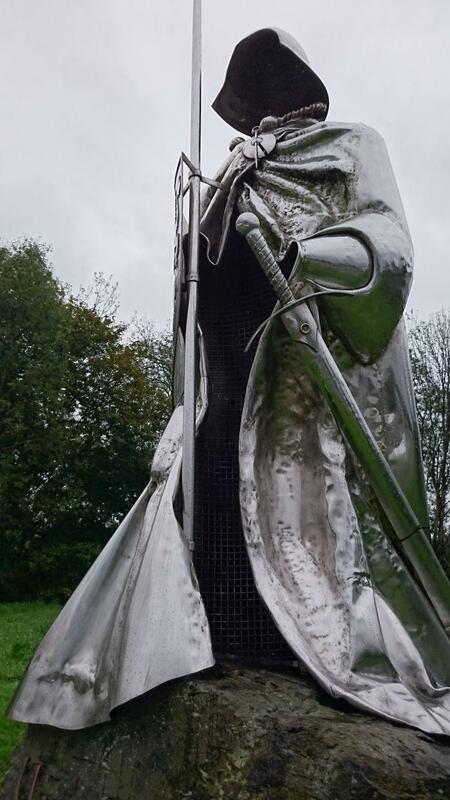 He refused to betray Owain Glyndwr and his army to the English king, for his loyalty he was hung, drawn and quartered. Glyn bids us farewell and sets off into the drizzle on his 800cc cruiser leaving Sharon and I to find the campsite. I really wish we were heading back to a nice warm dry pod as opposed to erecting a tent in a soggy field. Llandovery Caravan & Camping Park is not exactly a high-end campsite if I'm honest. Then again they're not charging high-end prices and the site is within walking distance of Llandovery town so I ought not complain. We appear to be camping on what might once have been the practice pitch of the large rugby club next door. The gound is drenched but there is grass, the toilets are basic but functional and clean and there is water. We have all we need. After making pitch we walk back into town to purchase our tea then settle in for the night. 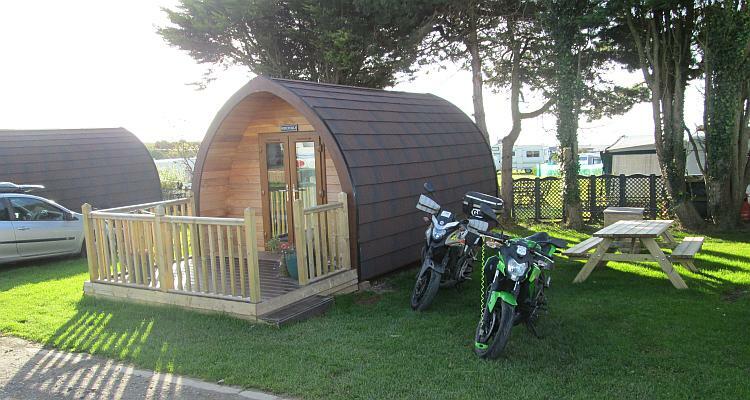 We are comfortable and dry where it matters but I am considering if it is possible to tow a camping pod using a motorcycle. Today we leave our Perfect Pod and I am sad to say good bye to warmth and comfort. Especially as the forecast is not looking great. Ahh if only I had the money it would be a Pod Life for me. Today will be a day of meeting up with folks. Both Lee and Glyn have contacted Ren and we have arranged to see them both. First stop off however is M&P's showroom. Which as it turns out also houses a Harley Davidson showroom and a Kawasaki showroom. Plus a cafe and a Barbers. I think the Barbers is great but where is the ladies salon? Come on people move with the times, us ladies are biking in force these days and believe me we worry far more about the state of our hair and having bad helmet hair days. Back on the bikes and it is full waterproofs time because it is raining hard. We eventually get to Lee's house and we are taken to his man cave. I like his man cave a lot. I covet his man cave a lot. I want this man cave a lot. I want a woman cave of my very own. I do not have a woman cave but I do have a hot cup of tea in my hand and somewhere pleasant to sit and dry off. So I try to leave Envy outside in the rain for a while. Lee is an active man that enjoys his outside activities including motorbiking and cycling. 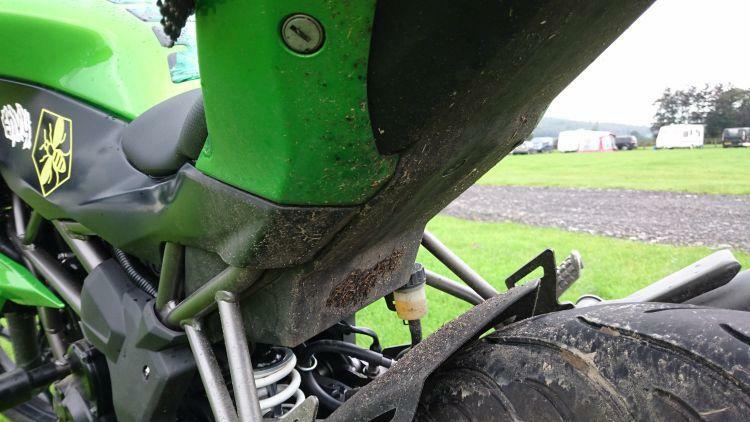 He seems to have met at one time or another a host of the known names in adventure biking. As such he had some good tales to tell about the people he has met and the places he has been. His energy and enthusiasm belies his years and I am surprised that he is nearly as old as myself and Ren. Maybe I should take up cycling again, you know get fit, hmmm I say this a lot and do feck all about it. I spent the first 35 years of my life being very active and fit. At one time I ran, cycled, swam and did aerobics weekly. The last 10 years have seen a decline to my now non existent fitness level. Maybe I did my quota while young and I can rest up now. My belly says no, my enthusiasm level says yes. Lee's man cave also houses a motorcycle he built himself as well as shelves of books by the various travel writers he has no doubt met. I recognise Cathy Birchall and Bernard Smith's book Touching the World is amongst them. Bernard is a good friend of ours and Lee has also met Bernard so we talk for awhile about Bernard and his book which I would highly recommend anyone to read. Both a courageous adventure and a touching love story you can not help but be moved by this soulful book. Time passes quickly with so much to chat about and soon it is time to depart in order to be on time to meet Glyn at a prearranged cafe. Lee offers to come with us and lead the way despite the heavy deluge that continues to pour from the heavens. Like all motorbikers who go out in all weathers Lee has given up on so called waterproof motorcycle gear. He pulls on his army surplus wear while Ren and I don our Berghaus over trousers and simple packaway lightweight jackets. The rain is relentless. I can barely see where I am going. Lee clearly knows this route like the back of his hand and is probably just riding from memory and therefore knows every bend and turn. We do not and are happy to let Lee disappear ahead and let him wait for us now and again to play catch up. Ahead lies the Black Mountain Pass. I was looking forward to riding this twisty, challenging road. Right now as a mist descends to reduce my vision even further I am not really wanting to be here. Hairpins emerge alarmingly from the thick mist and ghostly sheep shapes haunt the edge of the roads. Another hairpin to contend with, this time with the added joy of a side wind to push the bike about right on the crest of the apex. I wobble around the sharp bend with my usual antidote to such situations, a good scream in my helmet. This is unnerving, I am seriously struggling to see. I know there is sheep around and I just hope I do not fail to see one if it emerges suddenly from the mist in front of me. As we descend we finally leave the mist and switchbacks behind but the rain remains with us. We reach West End Cafe in Llandovery, our chosen destination to meet up with Glynn. We walk into the cafe leaving a trial of water in our wake. A little pool begins to grow around us as we take of coats and sit down. I am thankfully nice and dry underneath my outer garments. As I sup a cup of tea to calm my nerves Glyn arrives. Glyn is a quietly spoken gentleman with long hair and a gentle smile. We all sit and chat and enjoy each other's company. I like how motorbikes can bring strangers together like this, giving us a common ground to talk about and form new friendships. When you meet strangers you never know what may happen. We have been lucky today as both Lee and Glyn are good company and easy to talk too. 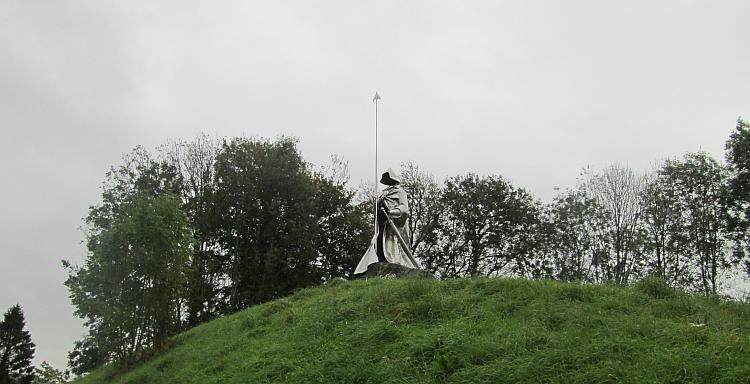 Lee departs for home and as the rain eases off Glyn takes us for a short stroll to the statue of Llyweln Ap Gruffydd Fychan and imparts his local knowledge on the subject. The statue is impressive and as such deserving of a few photos. It is the first time today I have dared to take my phone out as the rain finally stops. We bid farewell to Glyn and go in search of the nearby campsite. The campsite is on a Rugby club's grounds and is not 5 star. It is a bit of a come down after the luxury of the Pod. Despite not being thrilled with my abode for the night I concentrate on the positives, it is cheap and within walking distance of town. Plus even if it has been a wet day it has been an enjoyable one. All is good. Envy is wet and dirty. A bit like her owner. Muddy dirty, just to clarify heee hee. Sharon and Ren are planning on being at the forthcoming Manchester Bike Show (24-25 March '18) if you'd like to come and say hello. Find the Chunky Tread stand.